Hyperelastosis cutis (HC), otherwise known as hereditary equine regional dermal asthenia (HERDA), is a connective tissue skin disorder in Quarter horses. It is an inherited skin defect which causes horses to have abnormally fragile skin, making them more susceptible to injury and to developing slow-healing wounds. HC resembles Ehlers-Danlos syndrome (EDLS) in humans. Horses with HC are typically born normal and start to develop symptoms as they age. Affected foals will often develop seromas, hematomas, and ulcerations on their backs that get progressively worse with age and increase in frequency. Onset is typically associated with initial saddling or trauma. Horses with HC have also shown to have an increased risk of developing corneal ulcers. HC is caused by a missense mutation in cyclophilin B (Cyp). Cyp is significant in the triple helix folding of collagen. 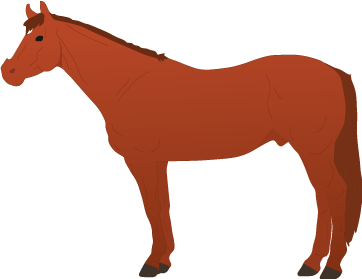 The mutation is homozygous in affected horses. There is no effective treatment and horses are usually euthanized; however palliative therapy is available.